The Newest PLATINUM Series Controller CNPT is Available Now! The CN76000 1/16 DIN controllers provide economical control for a wide variety of processes, including heating, cooling, and heat/cool. When used with the proper transmitters, these devices can also control pressure, flow, humidity, motion, or pH. The front panel is NEMA 2, 3R, and 12 rated for waterproof protection and is corrosion resistant. The sophisticated design of the CN76000 incorporates the latest microprocessor and surface mount technology, compressing an unprecedented number of standard features into a compact 1/16 DIN package. The user can program control functions from the front panel; input types are DIP switch selectable. Multiple tuning modes allow the user to select from 3 standard tuning presets, manual tuning, or autotuning. Standard features include self-diagnosis with fault indication. Non-volatile memory retains all process parameters when power is off, without battery backup. Settings for the optional alarm are configurable. The alarm action may be defeated on startup, or until the process value exceeds the alarm setpoint. The power interrupt feature will reset on power-up if the alarm condition no longer exists. Other standard features include min/max storage and display, auto/manual control, percent output indication, ramp and soak operation, 4 user-selectable security levels with password protection, and jumper-selected 5 Vdc pulse output to drive external solid state relays. 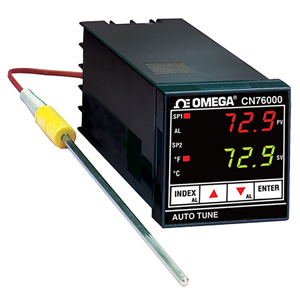 Optional features include RS485 communications, process recorder output. DC pulse/AC SSR†† Output with RS485 Communications and alarm. Not CE Approved. Relay/DC Pulse†† Output with RS485 Communications. Not CE Approved. Relay/DC Pulse†† Output with RS485 Communications and alarm. Not CE Approved. 0 to 20 mA Output with RS485 Communications. Not CE Approved. DC pulse/AC SSR†† Output 1 and Output 2* with RS485 Communications. Not CE Approved. DC pulse/AC SSR†† Output 1 and Output 2* with RS485 Communications and alarm. Not CE approved. Relay/DC Pulse†† Output1 and Output 2* with RS485 Communications and alarm. Not CE approved. 0 to 20 mA Output 1 and Relay/pulse* Output 2 with alarm and RS485 communiations. Not CE Approved. 참고: Each unit supplied with mounting bracket and complete operator's manual. *These outputs are logic jumper selectable between relay and DC pulse, or between DC pulse and AC SSR.